I just arrived in L.A. just hours ago to report on E3. While I was on the way to my hotel, I happen to read another attendee’s text. It read: Microsoft just announced the 3602. Apparently, this was some sort of misunderstanding. Unless Microsoft is planning to announce a second version of the Xbox 360 later at E3, the press conference that they held today was primarily devoted to advancements with the Kinect. Apparently, there will be more games that are Kinect compatible, like Tiger Woods, Madden, FIFA, Mass Effect 3, and Ghost Recon Future Soldier, as well as all future Tom Clancy games will be Kinect-able. I have no idea if “Kinect-able” is an official term, but it ought to be. 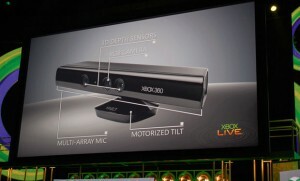 The Kinect will be used in new ways, like we once discussed with Forza4. Forza 4 uses head movement, and a Tom Clancy game allows the player to customize weapons with hand gestures. Fable: The Journey allows the player to use magic via hand movement. What is really going to sweep geeks off their feet is Star Wars Kinect, with use of the Force and a lightsaber. Kinect seems to be targeting those younger audiences with Disneyland Adventures as well as Sesame Street: Once Upon a Monster. All this, and adding Live TV to Xbox. It’s hard to believe that E3 hasn’t even officially begun yet! By the way, I believe that those who attended Microsoft’s Press Conference got a free Xbox. The same thing happened last year, and I missed that one too. Man, I need to get to E3 earlier!